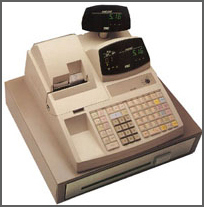 Loads Of Features, Innovation, Simplicity, And Efficiency, All In The Same Affordable Electronic Cash Register! Easy To Use 63-Key Keyboard. 600 Price Look Ups (PLUs). Six Media Keys (Cash, Cheque, Charge, Misc., Coupon, Food Stamp). Easy-to-Read 10 Digit Operator Display (Multi-Colour). Easy-to-Read 7 Digit Customer Display (Multi-Colour). Full Size Cash Drawer With Media Slot. High Quality Two Station Steel Drum Printer. 3.0 Lines Per Second (LPS) Print Speed. Handles Up To Three Taxes (Including GST), Tax Exemptions, Post Receipt, All Void, Discounts, Four Currency Conversions, and more! Management Reports: Management Reports: Department, Financial, Hourly, PLU, Media, Cashier, and Period to Date.